After reading the news on Chesapeake Energy, I tried studying the chart on CHK and found the chart looking quite good for long term investor. One core reason we think this stock may have chance to turn around is due to Billionaire Investor Carl Icahn recently bought into this company(read the news below). Looking at the chart, we see that the price drop sharply in May with High volume, we see this high volume as retail investor panic selling and share change hand to the big boys. Carl Icahn bought into this stock in May which is probably the reason why it stop dropping and followed by a rally. The chart shows that the 50ma is now very close to the 200ma (golden cross). In long term view, this stock will change its long term trend if price is above to trend above 50ma and 50ma above 200ma. What about mid term and short term? We can use the parabolic SAR as a guidance, after the news that Icahn increase stake, price turned around with parabolic dot goes below the candlestick, telling us a short term rebound is brewing. Activist investor Carl Icahn bumped up his stake in Chesapeake Energy, a company where he has already pushed for sweeping changes in governance. A regulatory filing shows Icahn now owns 8.98 percent, compared with a 7.6 percent stake in the Oklahoma City company he held this summer. 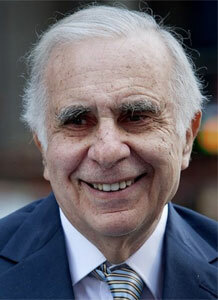 Icahn first invested in Chesapeake Energy Corp. in May. Chesapeake is one of the nation's largest natural gas producers. It has been reeling from a combination of historically low natural gas prices and questions from investors about its management.